Thyroid hormones are very important for everyday’s life since they control basal metabolic rate and oxygen consumption by the organism, but are still more important for the role they play in development of the central nervous system that is, in addition, an irreversible process. So all situations that could interfere with its normal function, and more specifically during the prenatal and immediately after birth periods, are extremely important. The ebook entitled “Thyroid Toxicity” by Del Pino et al proposes a very interesting and practical approach to the most frequent substances that could play a role interfering on its physiological activity. The book starts explaining the physiology of the thyroid system, exerted through thyroid hormones (THs), which acting through nuclear receptors present a wide variety of functions affecting metabolism, growth and maturation. Thyroid hormones are essential in early fetal life and immediately after birth to promote normal brain development. Two different periods can be separated in the process of brain differentiation. The first takes place during pregnancy in which the hormones of the mother are responsible for brain differentiation in the fetus and another postnatal period reaching two or three years of age in which the hormones of the baby play a very important role. These two periods are absolutely crucial for the normal neurological development of the child and if not enough hormones are available in this period the brain could be permanently affected. All the alterations that could appear in this time window are irreversible so any further treatment with thyroid hormones will not solve the neurological defects. Thyroid hormones are also responsible for growth from very early in the fetal period until sexual maturation. Alterations on hormone levels through this period, on the contrary to the previous one, is reversible, thus if a 6 year old child starts being treated with the lacking hormones the situation could be recovered and the child would reach a normal stature. Deficiencies and/or elevations in thyroid hormone levels may cause many clinical signs and symptoms, being the most important the deficiencies found in prenatal and immediately postnatal periods since they lead to mental retardation, low stature and in some cases also seizures and deafness. These alterations are irreversible, as mentioned before. During adult age, a slowing down of all the systems (nervous, cardiovascular, plasma lipids, etc) can appear with the reduction of hormones or by the contrary an increase in neural processing together with tachycardia and diarrhea and a permanent feeling of high temperature can appear when an increase is present. Thyroxin is one of the most frequently used drugs all over the world. Normally thyroid hormones are used in the treatment of hypothyroidism or goiter, but also cases of drug over-dosage have been reported (iatrogenic thyrotoxicosis). A special chapter of this book is focused on the prevalence, the consequences and the treatment of this complication when the hormone has been used for non-appropriate L-thyroxin treatment, like for obesity, or also following the ingestion of thyroid hormone contaminated beef with or after accidental thyroid hormones ingestion. Endocrine disruptors (ED) are gaining notoriety for the havoc they wreak on human body systems. EDs may affect the well being of several populations thus, a reasonable information policy about their health effects is of socio-economic relevance. The safety of some food additives, pesticides and of some UV screens, should lead to political activities to direct the proper use of these compounds. Information made available to consumers will help them make balanced decisions about their risks of exposure to these chemicals. However, exposure to EDs is unavoidable. Pollute the environment and are taken up by humans via unwanted and unidentified incorporation through the air, through dermal contact or through the food chain. These are most of the “classical ED's”. These ED's probably have effects in the brain, the cardiovascular system and the bone, and some of them might be exerted through interferences with the thyroid. Be intentionally administered to humans, but unwillingly incorporated. To these group belong certain cosmetics. Some absorbers of ultraviolet (UV) light present in perfumes, nail lacquer, after shaving lotions or other compounds and used as stabilizers, have been shown to display estrogenic and limited antiandrogenic properties as well as thyroid influences. Be deliberately and willingly administered to humans. Synthetic chemicals and plant-derived products included in some functional foods are eaten by humans in order to obtain some advantages. However, many of them exert not only estrogenic, but also antiestrogenic, antiandrogenic, antithyroidal and antiglucocorticoid activities. Furthermore, in this regard, flavonoids derived from soya interfere with thyroid hormone synthesis, release and binding to the transporter protein in the blood, i.e. transthyretin. Several natural and synthetic compounds are known to interfere with thyroid hormone binding proteins in serum, thus modulating free hormone concentrations and disrupting thyroid hormone homeostasis. Among the EDs tested so far genistein, a major isoflavonoid of soy containing food products as well as some similar compounds as daidzein and glyceitin are potent inhibitors of thyroxine binding to transthyretin. Furthermore, another polyphenolic nutrient, xanthohumol, contained in hops and some beer products also interferes with thyroid hormone distribution and transport in serum leading to altered thyroid homeostasis, increased elimination of thyroid hormones by the urine and lead to goitrogenesis by depletion of thyroid hormone and iodine stores in the body. Thus natural compounds contained in our nutrition, specifically interfere with T4 binding to transthyretin, therefore shifting T4 to thyroglobulin (TBG) and albumin binding. As transthyretin has different distribution space and target tissues compared to TBG and albumin, EDs might alter thyroid hormone homeostasis and tissue availability. Mutual interference of different hormone axes have been found, such as the steroid and thyroid hormone axis. Some EDs, active in the steroid axis, interfere with thyroid hormone related endpoints such as malic enzyme in the liver, which is an important information for future screening and testing programs on EDs in the hormone field. Thus many experiments already provide data for the necessary risk assessment with respect to multiorganic effects of EDs. A large number of compounds such as pesticides, drugs, heavy metals, cosmetics, industrial chemicals and natural compounds have been shown to also interfere with thyroid homeostasis by acting on different regulation points of thyroid hormone metabolism, binding to thyroid receptors or altering gene transcription regulated through thyroid hormones. There is special concern about thyroid disruptors because even small changes in thyroid homeostasis may adversely affect human health, especially during critical periods of vulnerability such as development, as has been mentioned before, but also during senescence or in sensitive population groups. UV filters are high production volume chemicals used for protection of human skin as well as for protection of products (UV absorbers) against UV irradiation. As demonstrated by recent chemical-analytical studies (e.g., sewage treatment plants, lake water), UV filters are released into the environment in significant amounts. The endocrine activity demonstrated for some of these compounds thus raises important questions of human and environmental health on the one hand, and on technical and economic aspects on the other hand. In view of the release of UV filters into the environment, such evaluations should not be limited only to human toxicity versus sun protection, but also include the environmental relevance. So far, only a fraction of the UV filters and UV absorbers used has been tested for endocrine activity, and only very few of them have been studied for long-term toxicity, the basis for risk assessment. Monitoring data are missing in humans and limited to a few isolated data in wildlife. A major finding from these experiments has been the effects of UV-screens on the thyroid hormone axis. These effects are probably independent from their also demonstrated estrogenic action. As these compounds are contained not only in sunscreens and various cosmetics but also as UV protectants for various products of daily life, the potential negative effects need to be further studied not only in animal experiments and also specially their interference with the human thyroid hormone axis requires attention since, especially in children, it reaches relevant concentrations. Regulatory agencies and policy should react to make sure that these substances may not be harmful to wildlife and humans. The studies available were supposed to provide new information as to whether the UV screens and the topical application of the stabilizer present in many cosmetics might be harmful to human health since they exert (anti)estrogenic, (anti)androgenic, (anti)thyroidal, or (anti)adrenal effects on humans. However, the prerequisite for such an effect would be the absorption of the substances through the skin. As it appears now OMC and 4-MBC do not penetrate in appreciable amounts through the skin when commercially available preparations were used. This was obviously not the case, but the evident accumulation in lakes, rivers or wastewater is also including additional concerns for human health. Even if a sufficient safety margin should be found for human use of an individual chemical, the problem of environmental contamination, i.e., contribution to the mixture of EDs, would remain. Several groups have investigated thyroid hormone related endpoints, such as hepatic deiodinase activity in livers of rats treated for several generations with UV screens. Livers from parent rats exposed to UV filters and their offspring of both genders were analysed for type I 5’deiodinase activities. Significant alterations after UV-screen exposure of rats, which are compatible with altered thyroid weights and altered serum thyroid hormone levels, were found as well as a second generation effect. Increasing doses of 4-MBC decreased hepatic type I 5’-deiodinase in males. Several chapters deal with these problems and with other environmental exposures that are associated with thyroid dysfunction in subjects with autoimmune thyroid disease and some are clearly identified as inducing thyroid autoimmunity. These chapters give some clues to the understanding of the relationship between environment and the genetic background. This should help in identifying patients at risk and may provide therapeutic options for the future. A specific group of pathogens, toxins and substances of biological origin, which may cause a disruption of the thyroid system either directly or indirectly through the systemic effects they induce, are called BSATs. The thyroiditis results in inflammation of the thyroid gland that can sometimes degenerate into destructive thyrotoxicosis. A chapter refers to the main agents that induce thyroid disruption and the known mechanisms through which these effects are induced. The thyroid effects of some drugs, such as amiodarone and lithium have been known for many years, but novel antineoplastic agents introduced more recently have become the focus of intense attention over the past few years. The corresponding chapter summarizes our current knowledge on drugs capable of altering thyroid function or structure, with attention to the underlying mechanisms. Metals such as Cd, Pb, Cr, Mn, Hg and Cu are known to induce thyroid toxicity in humans and animals. On the other hand, other metals are essential for the proper function of thyroid system such as Se, Zn and Fe among others, and their deficiency has been related to thyroid disruption. This is the subject of another interesting chapter of this book. Experimental evidence has shown the ability of multiple pesticides to affect thyroid homeostasis. By interfering with the deiodination of TH leading to increased T3 degradation; or by binding to TH-binding proteins and thus altering circulating TH levels; it may mimic TH action or may also interfere with thyroid function. Overall, experimental and epidemiological studies indicate that the induction of hypothyroidism is the general effect from pesticide exposure, supporting that this situation causes a decrease in TH activity. Given the important role of TH on metabolism and brain development, exposure to even low doses of thyroid-disrupting pesticides may contribute to increase the risk of thyroid disease and irreversible neurodevelopmental disorders. The thyroid gland is almost unique since it can be affected by both external and internal radiation wherein administration of radioactive iodide specifically affects the thyroid gland. One of the chapters focus on both types of radiation and the changes that can be seen acutely and chronically in the thyroid after it has been subjected to irradiation. In addition, the neoplastic potential of radiation exposure on thyroid follicular epithelium is presented and illustrated. Currently there is a significant increase in consumption of new types of foods called functional foods, especially soy, which could lead to a reduced availability of iodine and thus to goitrogenic effects. Also, the use of dietary supplements, which are widespread today, can cause thyrotoxicosis since some of them may contain fraudulently added active thyroid hormones in addition to minerals and dietary elements. Furthermore, plant supplements, which are consumed worldwide, may contain many components that could alter the normal functioning of the thyroid system due to their phytochemical components. Thus, the increasing use of plant supplements presents a particular challenge to health care of patients due to the high risk of potential interactions of these plants with thyroid function. For example high intake of plant foods from the Cruciferae family has been shown to induce goitrogenic effects in certain populations with reduced availability of iodine in their diet. The metabolism of cyanogenic plants like cassava, sorghum, bamboo, lima bean, which are important sources of carbohydrates for many populations, releases thiocyanate that has been proved to have also goitrogenic properties. Food additives used to preserve flavor or enhance taste and appearance could also induce disruption of the thyroid system. Nitrite and nitrate salts are added to cured meats such as bacon, sausage and ham to prevent the growth of bacteria spores and to add color and flavor. Nitrate salts are natural components of plants, found in high concentrations in leafy vegetables such as lettuce and spinach and in some root vegetables such as beets, and are also a contaminant in drinking water. Nitrate salts are of particular interest because they might cause thyroid cancer. Dye additive to foods such as erythrosine possess a negative effect on thyroid function in some cases. Foods are composed of a variety of natural compounds with nutritional effects. However, some of them may also possess anti-nutritional and thyreotoxic effects, such as glucosinolates. Currently, functional foods have been incorporated as sources of nutrients to our diet in order to meet certain nutritional requirements. However, their effects on the thyroid gland are unknown and should be determined in order to perform a complete risk assessments of these foods. Food supplements, are another source of nutrients, especially minerals and trace elements such as iodine and zinc that are necessary for the proper functioning of the thyroid gland, but if its use is not controlled, it might induce thyroid alterations. Finally, during food processing different chemical compounds such as nitrates and erythrosine can be used, which could also induce harmful effects on the thyroid. A special chapter discusses the different foods and supplements. Some natural flavonoids are known to inhibit TPO activity, the key enzyme for thyroglobulin iodination and iodothyronine coupling in thyroid hormone synthesis. A model of stable expression of human TPO in a human thyroid carcinoma cell line FTC-133 has been established, which allows functional analysis of TPO activity. Using enzymatic active membrane preparations of these TPO expressing cells the effects of ED on TPO inhibition has been analyzed. Several of the EDs concentration dependently inhibited TPO. An important novel observation is that iodide can prevent inactivation of TPO by EDs. This might have major implications with respect to EDs exposure, as many regions of Europe and the whole work still have inadequate iodide supply and intake, which might increase the risk of EDs exposure with respect to inhibition of TPO, the key enzyme of thyroid hormone biosynthesis. These observations might again have relevance in our societies, where soy intake increases and might interfere with availability of adequate thyroid hormone supply. Taken together the book is a very interesting piece of evidence, that we are surrounded by a high amount of substances that may interfere among others with thyroid function, and that this interference could be responsible for a number of possible alterations of our normal functions since the thyroid gland plays a very important role in keeping a normal function of our body. Thyroid hormones are involved in numerous physiological processes as regulators of metabolism, bone remodeling, cardiac function and mental status. Moreover, thyroid hormones are of special importance in fetal development, more particularly, the development of the brain. Thus, maintenance of normal thyroid functioning is essential for psychological, biochemical, immunological, endocrinal and physiological wellbeing of the body as well as correct development. 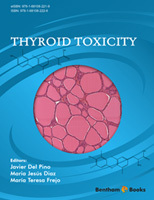 To our knowledge this ebook is the first monograph on thyroid toxicity. Thyroid Toxicity gathers all information about the toxic effects of different kind of compounds on thyroid system and the molecular mechanisms through which they induced these effects. This e-book answers various important questions such as the mechanism through which various compounds induce toxicity on thyroid gland, induce endocrine disruption and especially how they affect body and brain development and brain function. Aside from learning key concepts that may be overlooked while scanning literature, the reader will benefit from gems of information scattered throughout the book.